It becomes difficult to tie knots with 5x tippet when the temperature drops to near freezing and your fingers refuse to work. This is the dilemma that I found myself in yesterday morning. While everyone else was clocking in bright and early on a Monday morning, I was looking at an ice cold creek attempting to will my numb fingers to submit and listen to my brain. 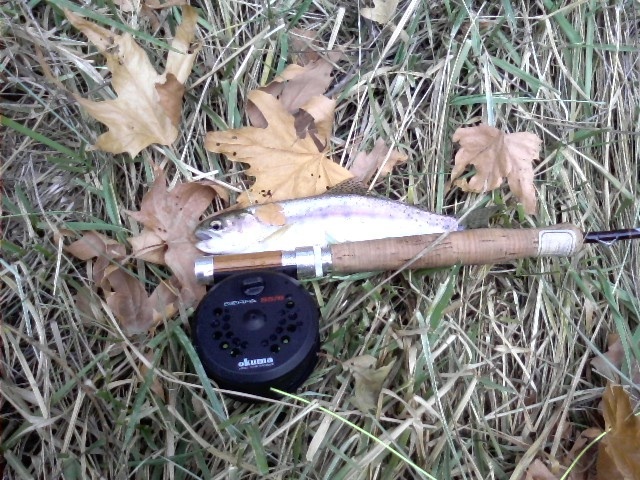 By some miracle, I was successful in tying on a small dry fly to my brand new TFO rod. After logging many hours of painting these past two weeks, I convinced my fiance and ultimately myself that I had earned a new fly fishing rig. 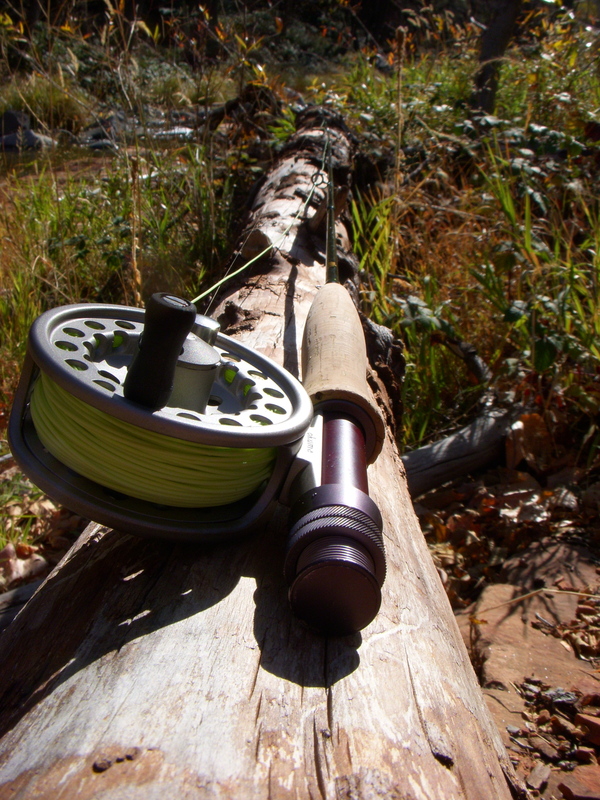 With a few months of researching, reading reviews, and trying then retrying different rods, I settled on a Temple Fork Outfitters Finesse 3 wt. 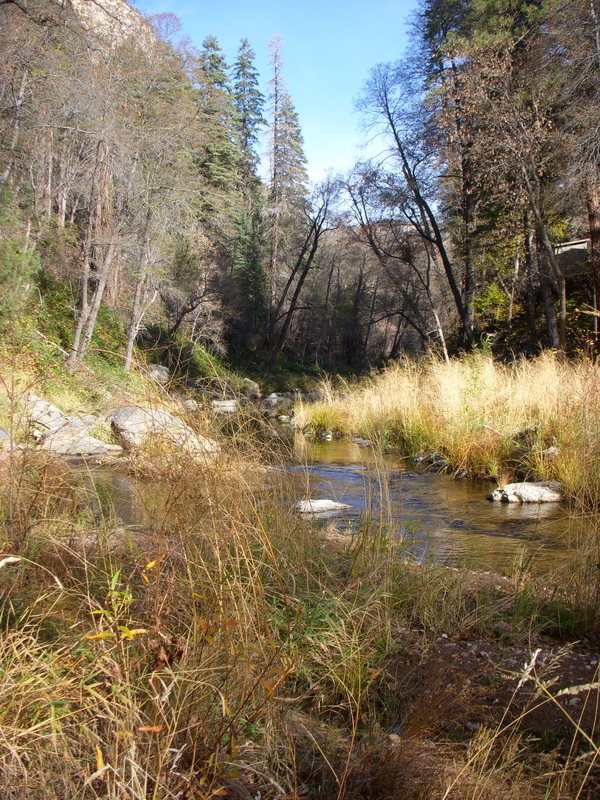 My patience and deliberation payed off yesterday with the enjoyment that I experienced on Oak Creek. I actually had a bit of a scare with my new setup. By the second or third pool I noticed that something was wrong. The rod was either not casting or the line was not shooting correctly. After careful inspection I observed that the guides of the rod were starting to ice over. This was my first experience with ice (because who expects ice in Arizona) and for the first few hours in the morning I spent a good portion of time picking ice out of the guides. Fishing was very slow with only two fish landed all day. I took my time and was able to spot several pods of fish before they were aware of me, but nothing that I was casting was appealing to them. 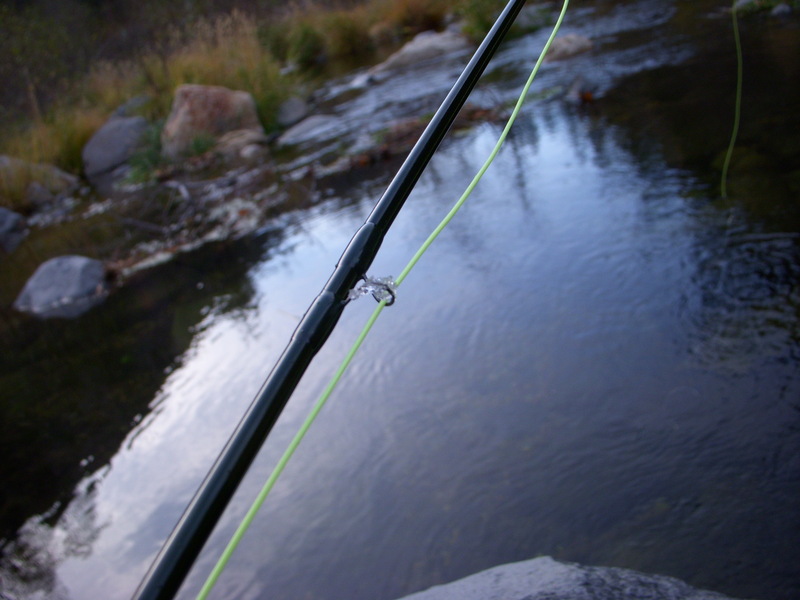 I fished all day and found myself in a large still pool about the time the sun was leaving the canyon. 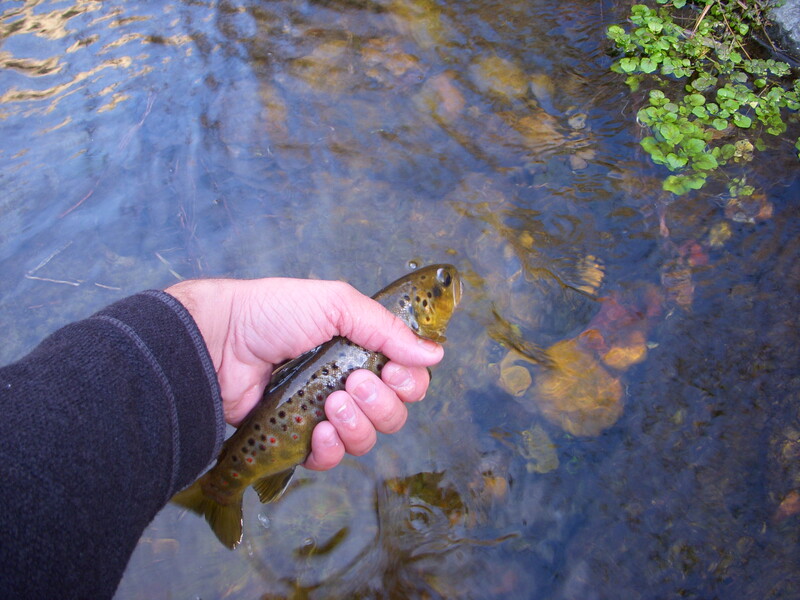 In this large pool, trout were rising to what appeared to be caddis flies. 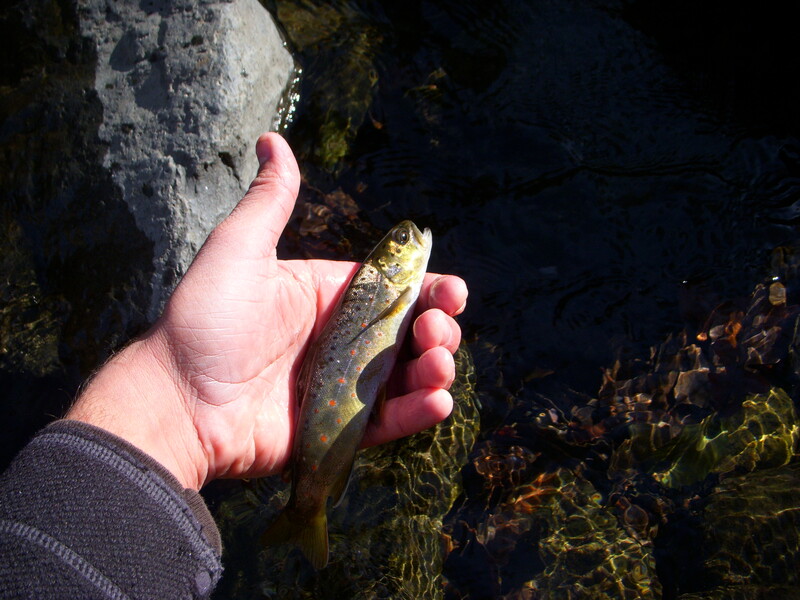 I tied on several different flies to try and “match the hatch” but again had no luck. The size of my #16 flies seemed to be a tad larger then the flies they were feeding on, but the experience of actually seeing a hatch was very inspiring. Hunger, the cold, and a desire to see my fiance (and Budder) drove me back to the truck. 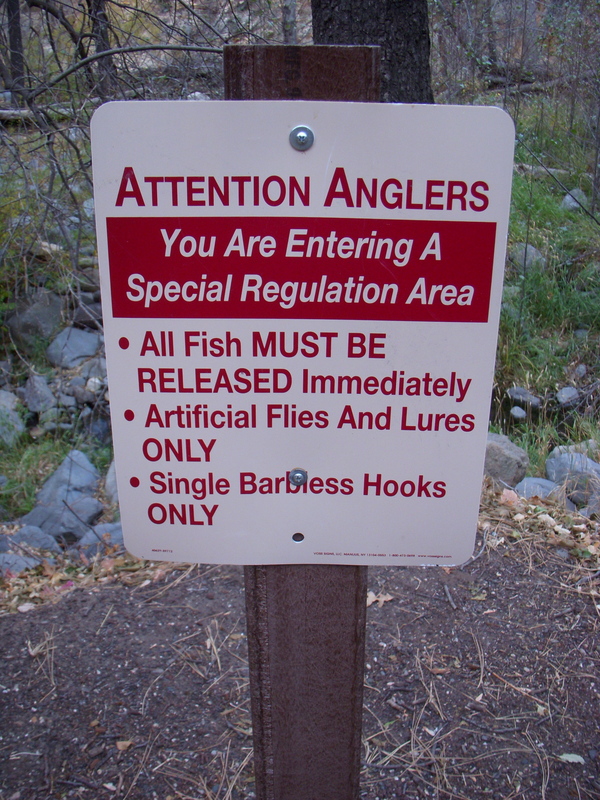 Roaring off to the valley, I realize I am hopelessly addicted to fishing. 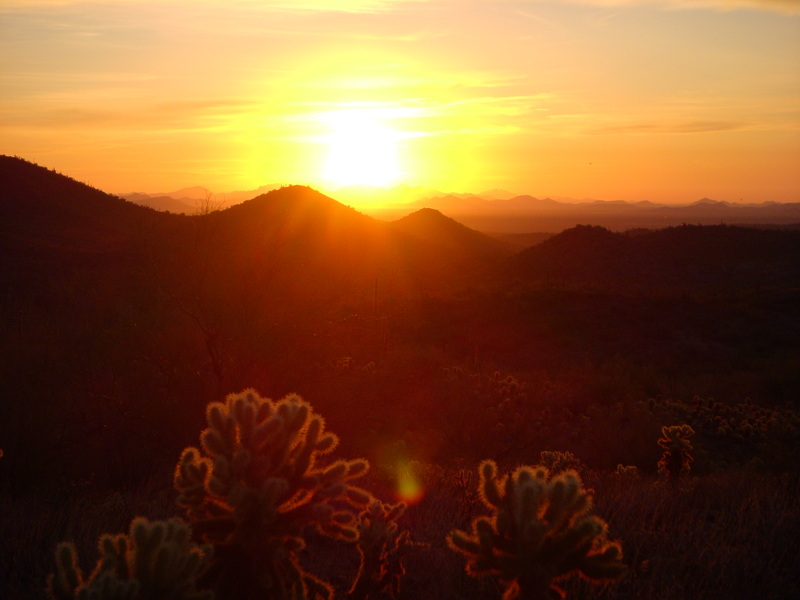 Words and pictures fail to describe the beauty of the Arizona desert at sunrise. 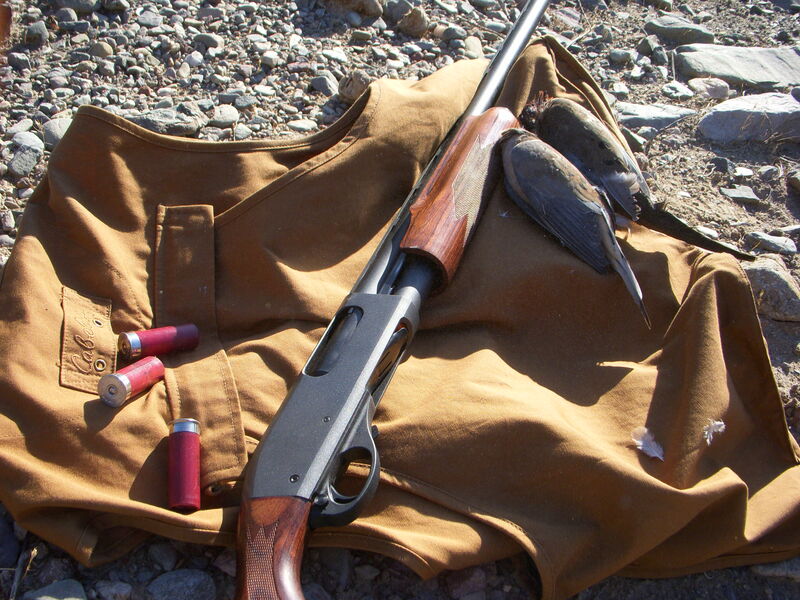 My buddy, Travis, and I arrived while it was still dark to one of our usually productive quail spots. This year has been a difficult year for the quail coveys with a drastic lack of water, but we have been successful in bagging a few birds each time we head out. The morning started out on a bad note when, as we were gearing up and drinking the last of the coffee, a large pickup truck passed and could be heard parking just a 100 yards down the wash that we were getting ready to hunt. Apparently, “our” spot is not as hush-hush as we have hoped. So instead of hunting the wash and the adjacent hillside, we headed off at an angle that would take us away from the other hunters. The brisk 45 degrees quickly disappeared as the sun warmed the hillsides. On our way into a tangle of mesquite, saguaros, and jumping cactus, we busted a few small coveys, but most of the birds in this area were pretty keen on what we were there for and kept at least a 70 to 80 yard distance from us. No matter how hard we tried to be quiet on the crunchy desert floor, it always sounds as if you are walking on bubble-wrap. We hiked farther than usual and looked at some different country, but were unable to capitalize on the quail that were in the area. We were on the other hand successful in bringing down several doves, whose season just opened Friday. The morning ended on a festive note as we stopped by Campbell Mercantile Store, a cornerstone of the Peoria community, and feasted on the morning’s special of biscuits and gravy while drinking copious amounts of coffee. Without a doubt, the morning was a successful way to start of my week long Thanksgiving break. The rest of the week should hold some more wanderings, perhaps into the water. Did I mention I love being a school teacher? Since moving to Arizona, I had yet to bag a big game animal. 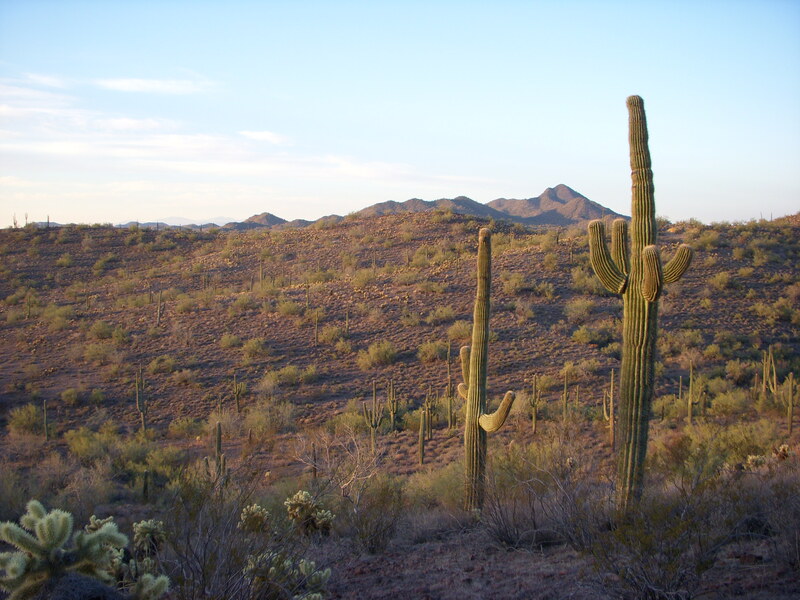 Hunting in the open desert and hills of Arizona is much different than the well worn game trails of Pennsylvania and New York. I had been able to buy over the counter archery tags to get out on the weekends in late August and early September, but have been unsuccessful with a bow and arrow. 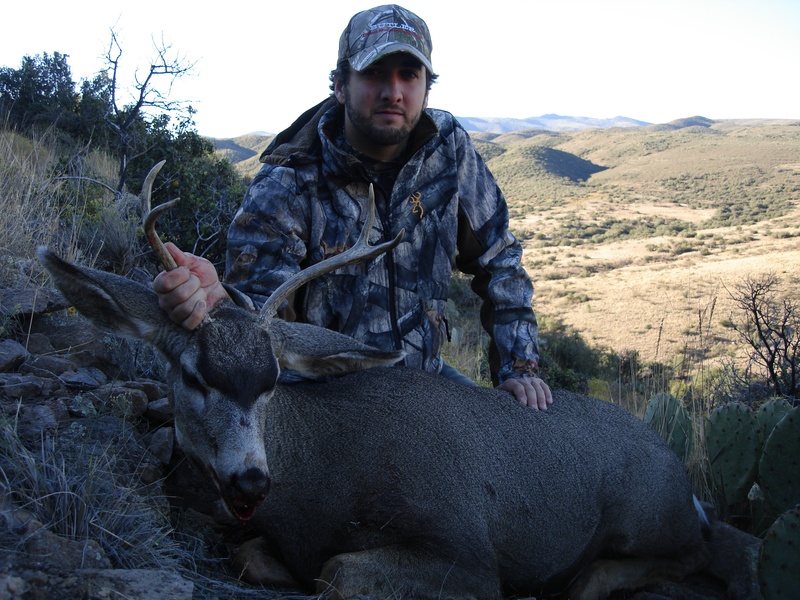 This last weekend was the first opportunity that I had to venture out with a rifle and chase around desert mule deer. I was accompanied by my good friends Austin and Travis. Travis and I both had a tag for a unit about an hour and a half outside of the city near the town of Yarnell. This would be my first time out with a rifle in Arizona and a first time for Travis to ever be hunting deer. Waking up early for opening morning, the sun found us hiking up a hillside to begin glassing the surrounding canyons. We jumped several different deer, of which a couple sported smaller racks, but no shots were had the first day. All three of us headed back into town for the evening to spend with our respective wives or fiance (in my case). On our way out of our hunting area, we spotted a heard of 30 deer moving through a stretch of private property which naturally raised our blood pressure more than a little. The next morning (Saturday), we decided to hunt the same area and while we made our way silently up the hillside, one of our party spotted movement across the valley. After glassing the herd for several minutes, we confirmed that there was a small buck in the group. The first shot of the day was mine and even though we could tell the buck was not a monster, I ventured out with the mindset of “bird in hand.” I hiked about a mile around and up to keep the wind in my face. As I topped the opposite hill I could see several hunters moving adjescent from me. Fearing they would spook the herd they could not see, I moved into position quicker than was advisable. I found myself looking at a gathering of deer all attentive to my every move. I made an offhand shot at roughly 100 yards and lost sight of my buck. Austin and Travis on the other hillside watched the scene unfold and saw the male deer drop 50 yards from the shot. Excitement and adrenaline coursed through my veins as I found my fork horn deer, downed with a decent shot through the shoulder. I sat down and drank my celebratory coffee as I watched my good friends struggle through an impenatrable maze of cat claw to my position.